Which Type of Speaker Is Best? Home > Sound > Which Type of Speaker Is Best? People often underestimate the value of a decent set of speakers. Whether you’re listening to a CD, watching a film, or playing a computer game, running your audio through the right equipment can really enhance the whole experience. Of course not everyone can afford to be at the very cutting edge of technology, and unfortunately it's generally true that the more you spend, the better the quality of speaker. However, making sure you have the right type of speaker setup for the job can not only make a big difference in terms of sound quality, it could save you a few bob too. For the best in sound for home cinema, the most popular kit is a set of 5.1 surround sound speakers. This setup consists of a large central sub woofer to provide bass frequencies, with 5 additional satellite speakers (tweeters) creating higher frequencies. The satellites are usually placed around the room in order to ‘surround’ the audience with sounds and create a more immersive experience. One of the first recorded uses of surround sound was all the way back in 1940 for the cinema release of Walt Disney’s Fantasia. The technique has been popular ever since and is now easier than ever to utilise in your own living room. If your computer doesn’t come with its own set or you’re looking to boost its sound potential, there are a few different types of speakers that are recommended for home computing. If you tend to use your PC more for work related tasks such as writing documents, checking e-mails and surfing the internet, then a simple set of small portables will do the trick. These are the kind that you often see people with in parks or on beaches that consist of two small tweeters that can usually run on both battery and mains power. They don’t produce exceptional sound quality but they are perfect for use on a PC when your needs are very basic and you are unlikely to listen to much music or video. On the other hand, if you are the kind of person who likes to run all their music and video through their PC, then you may want something a little more substantial. For this kind of use, a set of 2.1 speakers is best. These consist of a central sub woofer, supported by 2 small satellite speakers and are capable of producing tremendous sound quality without taking up too much precious desk space. Although most stereos tend to come with their own speakers, upgrading can really increase the power of your hi-fi. The sky is really the limit in this case, as speakers are available at over ten feet in height and can cost hundreds of thousands of pounds. Most stereo lovers opt for two or more large speakers, accompanied by an amplifier. The amplifier is important because most stereos are only designed to handle sound up to the volume that their speakers are capable of. 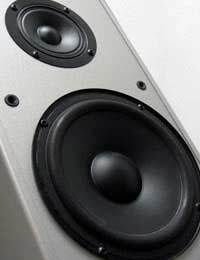 In order to get the best performance out of a bigger set of speakers an amplifier is needed in order to boost the power output. Another, slightly simpler way of improving your stereo is by using a set of 2.1 speakers, which come with a type of amplifier known as a pre-amp built in to the sub woofer unit. 2.1s can be easily attached to your stereo using just one cable, and are ideal for minimising fuss as well as reducing cost as well. In many people’s opinion, the best type of speaker setup is one that can be used for different functions. Although the most common speakers for various functions have been outlined above, this doesn’t mean they can only serve one purpose. For example, any set of speakers running through a separate amp can be used with just about any device thanks to the variety of different inputs that are usually offered on the back of amplifying units. The same can also be said for 2.1 speakers which are often designed so you can easily plug in your stereo, TV and mp3 player all at the same time. The most important thing when choosing a set of speakers is to make sure you’ve taken all your personal needs into account such as sound quality, volume, cost and space, and then try and get as good a balance as possible. Never be afraid to ask in store for advice, and always do a little research of your own before purchasing.